From High Level to Peace River, I made the drive, three hours, right after work. I was on my way to Edmonton to gather my son and his belongings after a year of University and to bring him home for the summer. I booked into a hotel room, brought my gear into the room and returned to my truck to search for a meal. 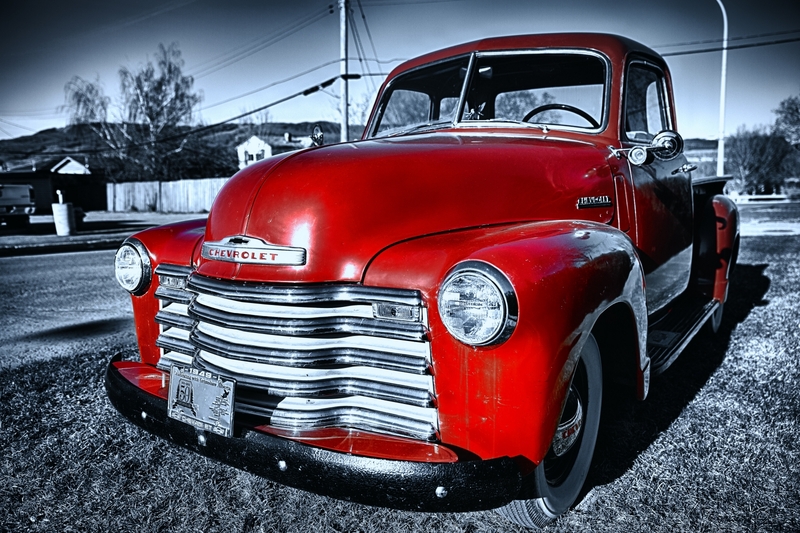 Before I got into my truck I looked across the way to this red 1949 Chevrolet, half-tonne. As a former auto detailer (in a former life), I walked over and then spent ten minutes looking it over. The owner came out and provided the truck’s story – where it came from, how he had restored the vehicle and that he still took it out for a ride occasionally. It had a straight six engine – clean, restored, still capable. The owner, an older fellow, initially thought I wanted to buy the vehicle. I told him that I was more bent on photographing vehicles than anything else. He took me into his garage and showed me a 1959 Edsel Corsair – red with white trim and top; again a restored vehicle. The windshield and back window curved around in places where present-day cars have posts to support the roof. I was amazed at the size of the trunk – in area and depth it might actually have held as much as a half-tonne truck box. The car was also about Chrome – chrome bumpers, chrome trim; shine was definitely part of what made this car something. It had old paint, the kind that if it faded you could bring back with polish and glaze. And, I suppose it reminded me of the polishing gleam, the alluring results of those first cars I polished as a young driver and as a lot attendant at Waterloo Mercury. The evening passed with more talk and the owner knew many of the people I’ve known through the years in High Level and La Crete, Alberta. I think he’d seen me take my L’Arrivee guitar into the hotel because he invited me into the house to play for him and his wife on his Taylor 615 a cherry-wood sunburst with heavier strings. I fretted Rickie Lee Jones’ ‘Starsailor,’ Dar Williams ‘The Beauty of the Rain,’ and Lifehouse’s ‘Me and You.’ I got him to play a few tunes – some country tunes that are becoming difficult with arthritic fingers. By the end of the evening, I had his permission to photograph his red 1949 Chevrolet half-tonne; not a bad evening. I clicked this picture the next morning. Easy time evenings, very nice memories. We’re just back from crazy London and the Chelsea flower show, so lots of words and pics to sort through. Nice post, and picture too, love the projection and perspective of the van. Isn’t it neat how location and time add to our perspective when revisiting words and photos. A day later often allows me to clarify and revise words and intention within a post. A day later allows for second or third … or eleventh attack on editing a photo (with fresh eyes).